I love small vehicles; that's obvious. However, one of the bigger (and by bigger, I mean MUCH bigger) vehicles that I've always loved is the Unimog. These rolling behemoths, made by Mercedes-Benz, have been around since the 1940s and are used from everything from farm and construction work, to snow plow duty and overland travel. The first time I ever went off-road driving (as a passenger), I went with a group of Land Rover owners and one biodiesel-powered early 1970s-era Unimog. That may have been the first time I got to see one up close, and frankly, I kind of fell for the big brute. Today, I saw an outstanding example of a Unimog on the way to work. It was a 1980s model with aluminum panels on the bed, a white cab, and LED running lights. It was just so cool; so huge. I was dwarfed in my Yaris. I got ahead of it by about a half mile, but had to stop at the light to make a left turn. I kept an eye in my rear view mirror for it. Sure enough, it came lumbering down the highway at about 50 MPH, looking as gigantic and out of place among other vehicles as it had when I pulled up next to it. But it's just so neat. It's basically the antithesis of a subcompact car, but I still think they're badass, amazing vehicles. 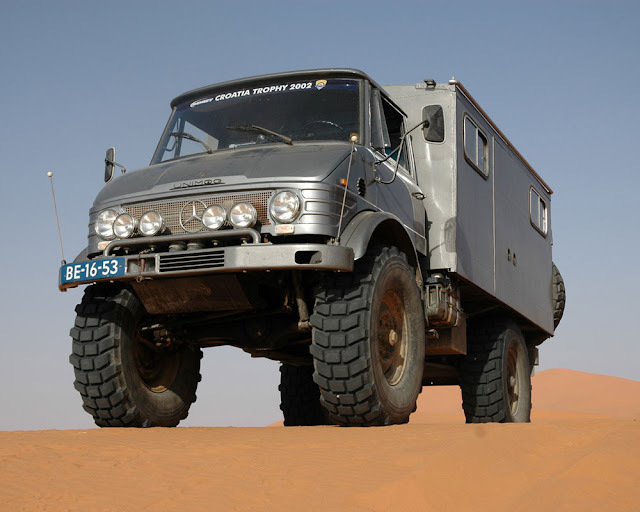 And while I have no plans to own one any time soon, if ever, if I ever won the lottery, I think I'd get a Unimog, just because they're awesome. Hey, I could probably put my Toyota Yaris or Suzuki Sidekick in the back! One of the cool things about Unimogs is they have what are called portal axles. These axles allow for extra ground clearance because the axle input is located above the hub, and is actually driven by a gear. This gives the Unimog excellent off-road capability by tucking the differentials up closer to the body. Here, you can see what the inside of a portal axle looks like, although it's not from a Unimog, you get the idea. It's a gear reduction system, and there's one at each corner. Pretty sweet, eh? So while my love for small cars endures, I'll always have a soft spot for that giant German galoot—the Unimog. For more stories about vehicles that are a little larger, check out our "A Bit Bigger" posts. Unimog ftw! If you love this and other similar vehicles (and who doesn't! ), I recommend following this hashtag on instagram: #adventuremobile.